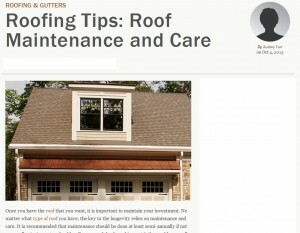 Once you have the roof that you want, it is important to maintain your investment. No matter what type of roof you have, the key to the longevity relies on maintenance and care. It is recommended that maintenance should be done at least semi-annually if not seasonally. An inspector should walk your roof slowly and inspect it thoroughly, as well as get rid of all leaves, branches, twigs and any other debris. An electric or gas blower does this job nicely. A roofing expert will look for things such as broken or missing shingles, shakes or tiles, and make the necessary repairs. Inspecting a roof is easier said than done; damages on roofing can remain hidden and cause leaks when least expected. To prevent unforeseen roofing problems in Menlo Park homes, householders should have their roofs examined at least twice a year by a professional. If any damages are spotted, Menlo Park, CA roofing contractors can repair or replace the flawed portion. It can be risky to wait until a leak occurs before deciding to have a roof repaired; and even if a leak does manifest, it can be incredibly difficult to accurately pinpoint the source of the dripping. Homeowners can attempt to climb to their roofs in order to spot any cracks or holes, but an untrained eye might fail to detect damages hidden beneath the layers of shingles and tiles. It takes an expert to completely find the root causes of leaks, and stop the problem to help preserve the roof’s longevity. Roofing companies such as Shelton Roofing can help locals properly identify the problems plaguing their roofing in Palo Alto, CA. More importantly, these capable roofers can also fix those very problems, or even replace the entire roof if the structure is deemed past its prime. Householders shouldn’t underestimate the importance of a regular roof checkup, as it can save their homes from costly water damage.